"This set contains 4 pieces Vinum Cabernet Sauvignon/Merlot (Bordeaux) and 4 pieces O Wine Tumbler Cabernet/Merlot. The exclusive and only for a short time available glass set of the established glass collection Vinum is offered at an attractive price advantage of 31%. Ideal to give as gift or to enjoy yourself. The Vinum Cabernet Sauvignon/Merlot (Bordeaux) glass showcases the majestically structured red wines in all their complexity and finesse. Vinum glasses have proved to consumers and restaurateurs that the pleasure of consuming wine starts with the glass. The handy machine-made Cabernet and Merlot glass of the space-saving glass collection O Wine Tumbler attracts attention through its stemless design. This makes it less susceptible to glass breakage and easy to put into the dishwaser. "O" is the ideal glass for everyday use and for every occasion. It is fun, feels good to hold, looks trendy and it works! 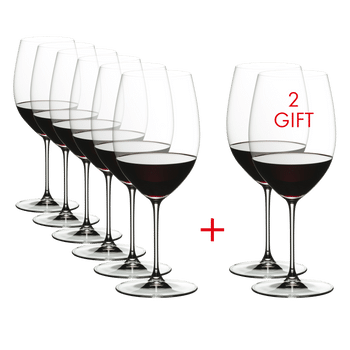 All RIEDEL glasses are dishwasher safe."